The prospect of ploughing through the complete works of Ezra Pound would have the members of most British book clubs choking on their chocolate digestives in horror. Not so the Tehran Hopkins Club; over the course of six months last year, its members analysed and annotated the late poet’s every obscure scribble without so much as a Kite Runner or a Curious Dog in sight – and what’s more, they loved every minute of it. Meetings are held every Monday afternoon in the disused offices of the banned literary magazine Karnameh; dust coats the desks and the posters are all peeling, but such touches only amplify the prevailing revolutionary atmosphere. The members hail from a variety of backgrounds – from impoverished students to culturally concerned doctors and dentists – but all attend meetings with the kind of reverence that would humble those jaded by literary freedoms in the West. Beyond dedication, however, the Hopkins Club lays claim to very little. Their mentors – a roster of literary luminaries including Foucault, Eliot and Derrida – offer advice that is mostly posthumous, and the club’s activities are extra-curricular, unofficial and entirely unfunded. 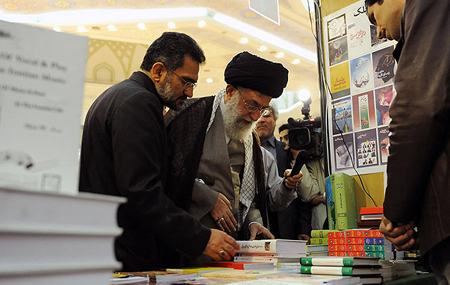 Meanwhile, the nation’s academic curricula and publishing houses are at the mercy of an intellectual mafia allied to the current government – which under the new hardline president, Mahmoud Ahmadinejad, is edging ever further towards a closed state of post-Revolutionary Islamic purity. For now, Tehran’s monolithic Shahr-e Ketab (Book City) sells an abundance of purely non-threatening English-language paperbacks – including a frankly staggering amount of Victorian ghost stories – but in the light of increasing restrictions on foreign films and last month’s blanket ban on Western music, even this can’t be guaranteed for much longer. As such, the Hopkins Club seems to be preparing itself for an undertaking of great cultural significance. Numbers continue to swell so rapidly that the offices at Karnameh are beginning to split at the seams. A new website has been set up as an open forum for Iranian literary enthusiasts as well as an archive for academic and creative writing of their own. Talks at the club – mostly by members – are booked up until April on subjects as diverse as modern Italian poetry and the philosophy of David Hume. In the meantime, the club has just finished analysing the work of the American poet Wallace Stevens, and is about to embark on an assessment of his contemporary, Hart Crane.